JENNIFER: We’re both long time readers of Sylvain Reynard’s stories, and I know you’ve been curious to see what SR could do with a supernatural series. After reading The Prince what are your first impressions? What do you think of SR’s vampyres and their world? MORGAN: Did you spell vampyres with a ‘y’ on purpose? SR told me many years ago that he wanted to write a vampire novel and I knew then that he had a dark side just waiting to get out. The Prince was even darker than I had expected. The Prince is savage, and worse yet, unreasonable! I didn’t know if I liked him or loathed him and I tend to enjoy reading complicated characters like that. As you know, I am a fan of creating and re-creating lore. What did you think of how SR used established rules and the new ones we hadn’t heard of before? JENNIFER: Yes. I did spell the word with a ‘y’ on purpose out of respect for the world created in the Florentine Series. I remember that we both were excited by the idea that the Prince had the ability to keep others of his kind away from his villa by making them feel physically ill whenever they strayed too close to his home. I have to admit that power could really come in handy sometimes. 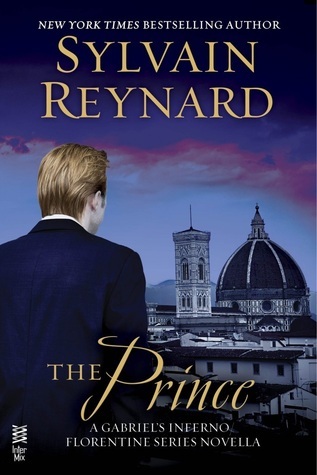 A lone figure lurked in the shadows outside the Prince’s villa, which overlooked the city of Florence. From the villa’s windows, one could enjoy an incredible view of the skyline – even at night. Not that the figure was able to enjoy that prospect. The Prince used strange magic to repel others of his kind, or so the figure averred. Half a block from the villa, which was more like a fortress, he felt nauseated and uneasy, his muscles twitching. No wonder the Prince had ruled the city for so long. No one was able to set foot inside his gates, let alone challenge him physically. Much of the vampyre lore I observed in The Prince was not unfamiliar, but I did enjoy how SR put a special twist on some of the usual vampyre rules. The moment when the Prince visits Santa Maria Novella and the Spanish Chapel stands out in my memory. I found myself replaying that scene over and over as I read The Raven. To me, it was an outstanding opportunity to study the true character of the Prince. I heard you chuckling quite a bit whenever the Prince offered his unsolicited opinions about my beloved Professor Gabriel O. Emerson. May I ask what was so funny? MORGAN: It was clear to me that SR was making the conversation between the Professor and Julia sickeningly sweet and I liked how it annoyed the Prince. I related to his character in those moments by wanting to kill them myself. I’m glad you brought up the “warding” of places to keep other vampires away. It was a cool bit of writing that I had never encountered before. I get the feeling that Aoibhe will have a bigger role to play in future books. What do you think about her? “How does it feel to be dead, my lord?” Aoibhe addressed him in English as she entered his private rooms near the Council chamber. He was seated in a tall wingbacked chair, perusing a leather-bound volume of Machiavelli and listening to medieval music, which he found soothing. “There are many kinds of death. The littlest of them is my favorite.” She gave him a heated look. He lifted his eyebrows but said nothing. “I see you have yet to go into hiding.” She regarded his lavishly decorated apartment with appreciation. “I wished to retrieve a few items.” He pointed to some books and a couple of manuscripts that he’d placed on a nearby table. The Prince took a moment to examine her features. She was beautiful and strong and very, very ambitious. He wondered if she resented Niccolo’s elevation. At the moment, it seemed clear she wanted something: he simply wasn’t able to discern what it was. JENNIFER: This is probably a good time for us to mention that while I went on to read The Raven, you haven’t yet had the time to do so. There are a few things I know about Aoibhe now that you don’t, and yes I would say your instincts about her are correct. A few weeks ago, I mentioned online that I thought Aoibhe was a scene stealer (along with who knows what else). She is a fascinating character and, truthfully speaking, I’d love to see a novella that focuses on her. She is cunning and ambitious and I think she has a deeper hold on the Prince than he’s willing to admit to anyone, even himself. Having read the Gabriel’s Inferno series, we’ve become more familiar with Florence, Italy over the past few years. What did you think of SR’s decision to expand on the setting by populating it with an underworld of vampyres? MORGAN: He used his setting well, and didn’t just describe its beauty, but its grit. An historic and art filled city, Florence makes for a great place to tell any story; but this one in particular was aided by its magnificent backdrop. It was the Prince who stole the show, however, with his consuming arrogance and his insurmountable power. He captivated me. He is bloodthirsty, and not just because he’s a vampire. There is a rage inside him, a need for satisfaction even though his logic is unjustified. I’ve been wanting to ask you questions about The Raven and whether or not the Prince gets called out on his mindset, but since this is a post about the novella, I’ll restrain myself. Do you like this new direction SR is taking as a writer, moving from romance to life and death supernatural drama? Does his exploration of evil up the ante for future books? JENNIFER: I’ve been a fan of supernatural stories for most of my life, so I’ve been looking forward to The Florentine Series for a while now. Although it was tempting to devour the story, I forced myself to read The Raven slowly. There is so much I’d love to talk to you about, so I hope you get the chance to read it soon. I can say with confidence that if you enjoyed your introduction with The Prince, then you would definitely like The Raven. In the novella, the Prince witnesses a private moment between the Emersons that stays with him and this begins to influence his choices during The Raven. I find the complexity of his character absorbing. The Prince’s vampirism is a trait that cannot be ignored, but I see it as merely one aspect of a very complicated individual. There is still plenty of romance within the story, so fans of the Professor shouldn’t be disappointed in that regard; and yes, I think SR’s exploration on the themes of justice and mercy have made for a compelling read. I’m very much looking forward to the next two books. If you’ve enjoyed our talk today and would like to look up Sylvain Reynard and his works, here is the Goodreads link for you to check out. This entry was posted in Books, Discussion, Discussion Questions, Favorite Books, Interviews, Morgan and Jennifer Locklear, Reading, Sylvain Reynard, Writing and tagged Jennifer Locklear, Locklear Library, Morgan and Jennifer Locklear, Morgan Locklear, Sylvain Reynard, The Florentine Series, The Prince. Thank you! I haven’t read it yet on purpose because my b’day is next month and I’m hoping I get it as a b’day gift. Every time I see blogs like this talking about it, I get so damn excited. I can’t wait to delve in! I just finished the Prince, and I was undecided about reading this series. I fell in love with the Professor and Julia, while reading Gabriel’s Trilogy, and was curious about the Prince, even though, I’m not a big fan of supernatural stories. I didn’t read The Raven, but after reading your discussion, I just might give it a try. Sylvain Reynard has a captivating style, The Raven drew me into this series “against my will”. I found myself liking the Prince, even though, I didn’t want to. I agree that the Prince is less likeable in the novella, but do give The Raven a chance. The more you read about him, the more fascinating he becomes. The things that the Prince experiences in the novella begin to alter his thoughts and actions and this shows up during The Raven. Great Job Jennifer & Morgan. Loved the conversation about the Prince & the underworld of Florence.